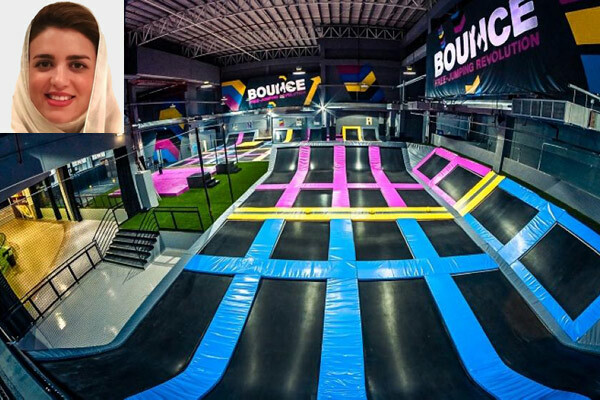 Bounce Middle East, a leading trampoline park operator in the UAE, has announced plans to build the world’s first female-only trampoline park in Riyadh, Saudi Arabia after its successful opening in the city of Jeddah last year. The 3,000-sq m venue on Riyadh’s East-West Road will be packed with over 80 interconnected trampolines, a dodgeball arena, slam dunk, huge inflatable air bag and the famous X-Park, reported Saudi Gazette. Bounce will be bringing its high-energy trampoline park and X-Park adventure challenge course to the Saudi capital allowing the female residents to literally fly through the air and bounce off the walls, stated the report, citing a senior official. "Our first trampoline park in Saudi opened last year in Jeddah and the response has been electrifying. Thousands of families in the city are enjoying this new way to have fun and stay active," remarked Mashael Attieh, managing partner of Bounce Saudi Arabia. “Did you know that 10 minutes of jumping on a trampoline burns the same number of calories as 30 minutes of running; that’s not from me, just ask the guys from Nasa. The beauty of this is that it’s a lot of fun and you don’t even realize you’re getting an amazing full body workout,” said an elated Attieh. "With this Riyadh park, we will provide ladies of all ages and abilities with one of the newest and most popular entertainment options in the market, as well as a training ground for all things aerial sports," she added.